Well dav1d certainly won't get slower through any of their efforts. That said, dav1d puts a lot of effort into AVX2, which current-gen Ryzen doesn't even do particularly fast, so..
Additionally, that Trello "av1 decoder" task existed before dav1d was even a thing, and contrary to the Phoronix article, dav1d is actually quite decently fast on 8-bit content (work on speeding up 10-bit has started). BUT, one should know that an encoder basically contains a decoder already, because it has to practically decode encoded frames to get accurate reference frame information, so splitting that out may always be an option. Last edited by nevcairiel; 9th April 2019 at 15:49. Dav1d will be always better for us end users, I think that's almost certain. SVT encoders are kind enterprise code which likely won't be too receptive about various issues of users in the wild, who have weird needs like non-AVX2 CPUs, non-mod16/8/4 video (for example) and integration into various players which the coders of these server-side encoders for commercial use are not going to see as important or even be aware of. Dav1d devs are going to be more in touch with this and generally, the ffmpeg circle sort of development has proved itself with decoders. "avif" from the AVIF spec itself. and finally "MA1B" or "MA1A" to identify the AV1 profile in use. Or various alterations of the above for special types of images. 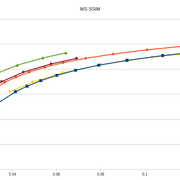 ... this ISOBMFF image format stuff is a real mess. As I read it, "miaf" is required for AVIF, and defines a fair number of important constraints. I wish it was possible to view MIAF's draft standard, but if you aren't in MPEG, ISO, or IEC it looks like that's not possible at all for at least another month. Last edited by foxyshadis; 10th April 2019 at 05:28. 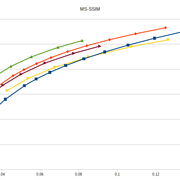 Though Intel does seem to like segmenting their CPU lineup with regards to AVX feature-set. 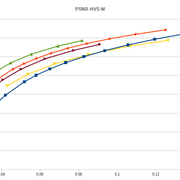 The multi-threaded gain seems to be more significant than the AVX2 loss for current-gen Ryzen. Seems that rav1e is prioritising chunked/segment encoding early on to maximise parallelism, they just opened a new project list to target specific tasks. Link here. How does chunked/segment encoding work? Much like the name suggests, by splitting the file to be encoded by chunks/segments, each being encoded in a separate instance of the encoder, but each also having the lower parallelism of tile or frame based encoding on top of that. Its more beneficial for systems like servers, or dual socket workstations with large core counts, where the WPP, tile and frame parallel techniques are not enough on their own to saturate all cores with work. Apparently it has its own problems such as memory consumption and chiefly the time taken to initialise each instance. Also the segments would have to be chosen based on detected scene change otherwise you could have some very obvious bitrate changes visible mid shot. 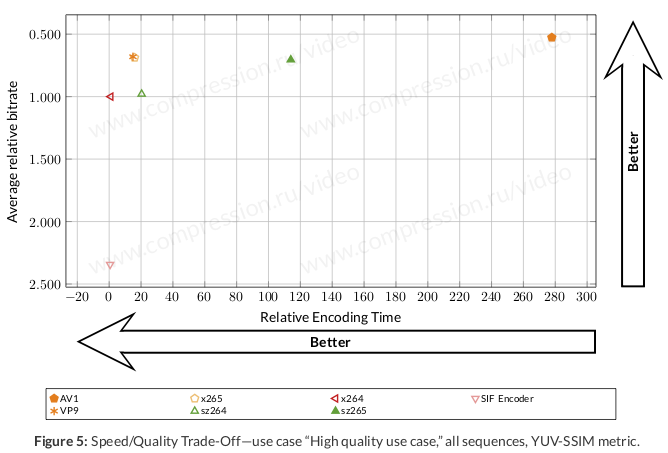 I dont think it is suitable for real time encoding, unless you have a significant time delay on transmission to detect scene changes before carving up a new segment to be encoded possibly? Last edited by soresu; 14th April 2019 at 22:13. 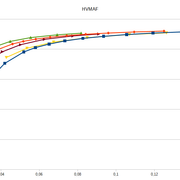 MSU received many requests on the results of announced AV1 participation in comparison. AV1 is quickly being developed, but still too slow to participate in our usual fast-universal-ripping use cases. This is why AV1 was included only in this special report (so as in 2017). This part of the comparison usually releases later because of much lower encoding speed than in other use cases (formal limit was 0.005 fps but actually unlimited). (Important note: in 2017 we used VBR mode for AV1 encoder, and in 2018 constant QP was used, as VBR was several times slower). 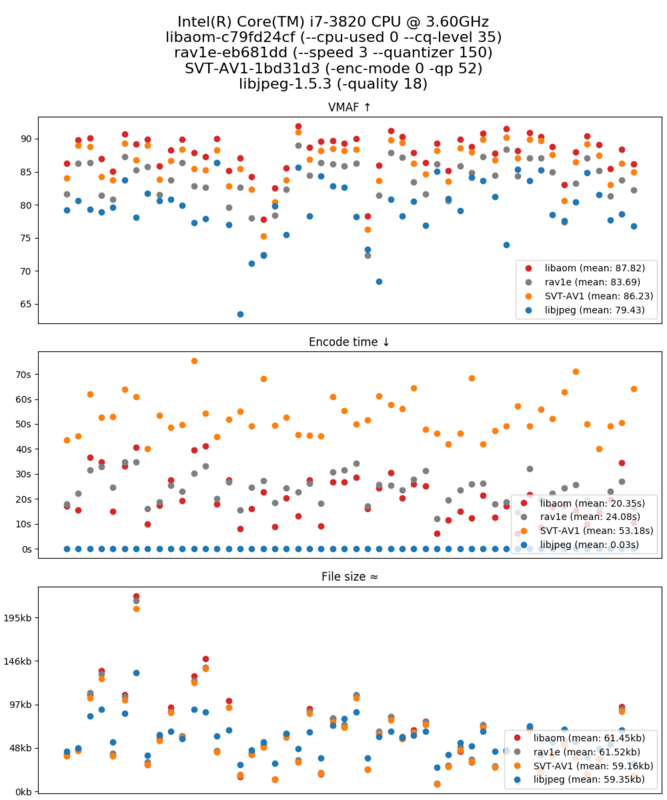 TearsOfSteel720 and TheFifthElement, two clips in the 720p category, have a vertical resolution incompatible with SvtAv1EncApp (not divisible by 8), so they have been excluded from all measurements this time. Next time they will be padded, all the encodes re-made and quality measurements re-taken. Meanwhile, rav1e has got a nasty bug that makes it bloat encodes, which brings up to 25% BD rate regression, so it has been excluded from this edition. I'll try to post an amendment when the above problems have been fixed. Good to see you're not dead - you hadn't logged in for nearly 4 months. Anyway quick question - since dav1d seems to be pretty much the standard go-to AV1 decoder nowadays, I don't suppose you'd be interested in the possibility of more decoder performance tests? Basically I'm thinking how that Presage Flower video clip you had me test is going to have pretty outdated results regarding AV1's relative CPU software decoding requirements seeing as dav1d is like 50% faster even on CPUs that don't support AVX (I've not yet tested it on CPUs without SSE4.1 and/or SSSE3 however). Do you know how these new commandline options in ffmpeg affect quality/speed for AV1? 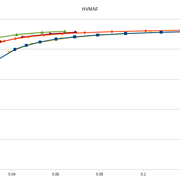 1) Comparision of libaom, SVT-AV1 and rav1e for still-image coding on subset1 from derf's collection. JPEG files are also encoded with libjpeg for the reference. Static 64-bit builds for Windows, macOS and Linux are available at releases page. Any comparisons for lossless AVIF? Chrome will use dav1d by default for decoding. The numbers are 3 months old but I don't think they have moved too much. Unless dav1d has started adding 10bit asm or has made big improvements in the multithreading department I don't think there'll be much to see w.r.t. 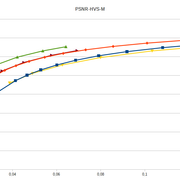 improvements against my Presage Flower encode (10bit YUV420P), but you're very welcome to try and prove me wrong of course, benchmarks are always good! I never tested any of that flags with the exception of frame_parallel, which I always set to 0 (disabled). I'd imagine one would want to leave the CDEF filter on, but I have hardly any idea what most of the others do. Last edited by SmilingWolf; Yesterday at 21:20.